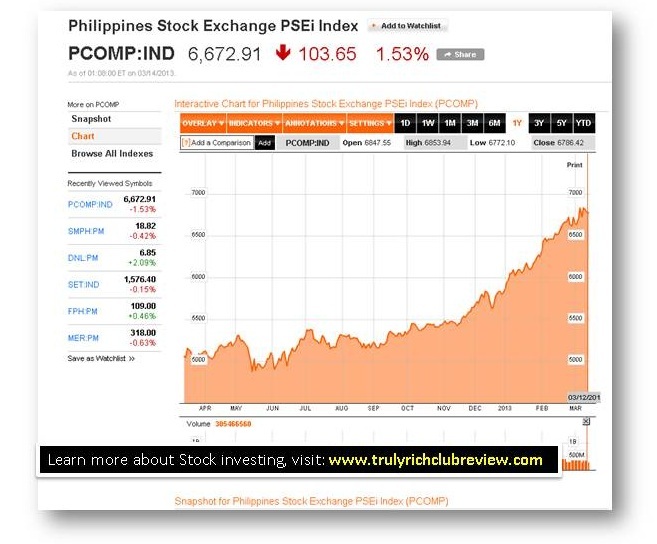 Philippines Stock Exchange PSEi Index - As of As of March 14, 2013 is now 6,672.91. We are down a bit, but nothing to worry. We in the Truly Rich Club community are committed to invest in long run. I am happy to know that some of our favorite stocks included on SAM (Strategic Averaging Method) are still on the list of TOP gainer. Happy Investing to everyone. 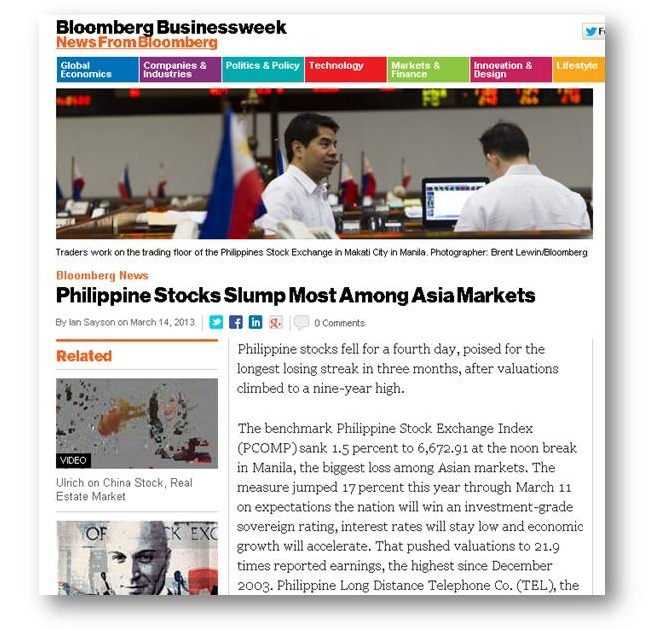 "Philippine stocks fell for a fourth day, poised for the longest losing streak in three months, after valuations climbed to a nine-year high. The benchmark Philippine Stock Exchange Index (PCOMP) sank 1.5 percent to 6,672.91 at the noon break in Manila, the biggest loss among Asian markets. The measure jumped 17 percent this year through March 11 on expectations the nation will win an investment-grade sovereign rating, interest rates will stay low and economic growth will accelerate. That pushed valuations to 21.9 times reported earnings, the highest since December 2003. "Philippine shares fell in early trading Thursday as the market enters the fourth day of correction on profit-taking in the absence of market-lifting news. The benchmark PSEi tumbled 1.53 percent, ending the morning session 103.65 points down to 6,672.91. 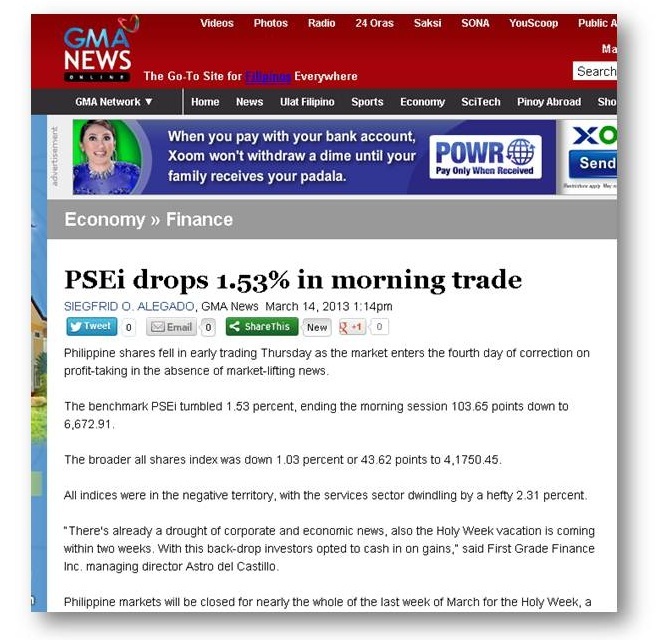 The broader all shares index was down 1.03 percent or 43.62 points to 4,1750.45. All indices were in the negative territory, with the services sector dwindling by a hefty 2.31 percent. “There's already a drought of corporate and economic news, also the Holy Week vacation is coming within two weeks. With this back-drop investors opted to cash in on gains,” said First Grade Finance Inc. managing director Astro del Castillo. Philippine markets will be closed for nearly the whole of the last week of March for the Holy Week, a Christian holiday." - source: here. 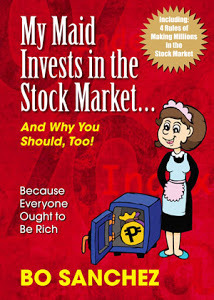 The Truly Rich Club principle is to invest in the stock market in the long run or do it by long term investing. Not in a month, not in a single year, but 10 to 20 year or more. If the stock is turning down, I believe TRC members (including me) are rejoicing because we can buy stock in a cheaper price. Since we're doing it for the long term, I am not worrying if the stocks goes down as long as I am following the Strategic Averaging Method, no need to worry. "You’re neither right nor wrong because other people agree with you. You’re right because your facts are right and your reasoning is right – that’s the only thing that makes you right. And if your facts and reasoning are right, you don’t have to worry about anybody else." So excited on the next Truly Rich Club Stocks Update. From this update (Aside from the news related to Stock Market Investing in the Philippines) I can see what are happenings on the market, specially on the selected company under the SAM strategy.